http://tv.globalresearch.ca/2012/04/bitter-seeds-plight-indias-farmers-trailer“Bitter Seeds” explores the future of how we grow things, weighing in on the worldwide debate over the changes created by industrial agriculture. Companies like the U.S.-based Monsanto claim that their genetically modified (GM) seeds offer the most effective solution to feeding the world’s growing population, but on the ground, many small-scale farmers are losing their land. Nowhere is the situation more desperate than in India, where an epidemic of farmer suicides has claimed over a quarter million lives. 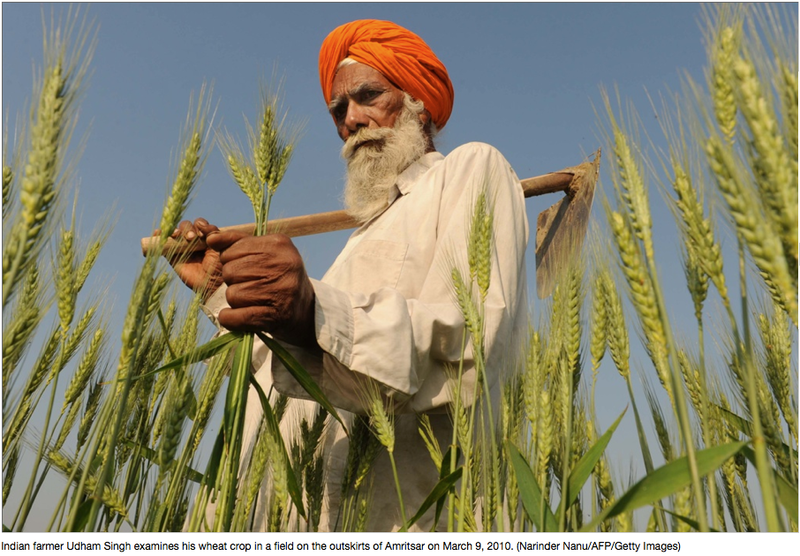 Every 30 minutes one farmer in India, deep in debt and unable to provide for his family, commits suicide.Following a U.S. complaint to the World Trade Organization, India had to open its doors to foreign seed companies. Within a few years, multinational corporations had taken over India’s seed market in a number of major crops. Now only GM seeds are available at the shops, requiring India’s farmers to pay an annual royalty. The GM seeds are much more expensive; they need additional fertilizers and insecticides and must be re-purchased every season. While large farms have prospered, the majority of farmers find it increasingly more difficult to make a living off their land.“Bitter Seeds” follows a season in a village at the epicenter of the crisis, from sowing to harvest. Like most of his neighbors, cotton-farmer Ram Krishna must borrow heavily in order to afford the mounting costs of modern farming. Required by a money-lender to put up his land as collateral, he gambles on everything he has. When his crop is attacked by pests, Ram Krishna must do whatever he can to avoid losing the family land. Adding to his burden is another duty – his daughter has reached marrying age, and he must find the money for an expensive dowry. Ram Krishna has just become a candidate for joining the ranks of the farmers who commit suicide in despair. Weaving in and out of Ram Krishna’s story is that of his neighbor’s daughter. Manjusha, a college student, is determined to become a journalist and tell the world about the farmers’ predicament. Her family opposes her plans, which go against village traditions. Manjusha’s ambition is also fueled by her personal history – her father was one of the suicide victims. When a newspaper reporter agrees to look at her writing, Manjusha takes on Ram Krishna’s plight as her first reporting project. Armed with a small camera from the production team, her video becomes part of the film. The film follows the seeds salesmen from the remote village in the state of Maharashtra to their company’s headquarters. Interviews with seed industry executives (including Monsanto’s) and their critic, Vandana Shiva, flesh out the debate. “Bitter Seeds” features compelling characters to tell a deeply moving story from the heart of the worldwide controversy about the future of farming. “Bitter Seeds” (Micha X. Peled, U.S., 2011) Just what we all needed: more incontrovertible evidence of the bald-faced evil of Monsanto. This documentary on destitute Indian cotton farmers follows an 18-year-old girl named Manjusha, a budding journalist who investigates the vast numbers of farmer suicides since the introduction (and market stranglehold) of “BT” cotton — which uses the corporation’s proprietary GMO technology — in the region of Vidarbha. Before BT took over in 2004, these cotton farmers relied on cheap heritage seed fertilized only by cow dung, but the largely illiterate population fell prey to Monsanto’s marketing blitz and false claims, purchasing biotech seed that resulted in pesticide reliance, failing crops, and spiraling debt. It’s a truly heartbreaking and infuriating story, but much of the action feels stagey and false. Should Indian formality be blamed? Considering the same fate befell Peled’s 2005 documentary China Blue, probably not. Still, eff Monsanto. The husband-wife duo Nandan Saxena and Kavita Bahl, armed with a camera and “an iron soul”, set forth to Vidarbha to film the stories of farmer families who had lost their sons, brothers and husbands to suicides due to mounting debts, to render visible the issues of the marginalised small farmer and bring back into focus the forgotten stories of Vidarbha’s farmer suicides. Their film “Cotton for my Shroud” was screened last week at Suchitra Film Society. “Since 1995, a quarter of a million Indian farmers have committed suicide, most of whom were cotton farmers from Vidarbha in Maharashtra,” inform the filmmakers. The couple began filming “Cotton For My Shroud” in 2006 when Vidarbha had recorded the highest number of suicides. They were supported in their endeavour by Vidarbha Jan Andolan Samiti, an NGO actively involved in advocacy on farmers’ issues. The suicide of a farmer wasn’t just another statistic for them, but a precious life lost due to faulty government paradigms. It took them almost five-and-a-half years to put the film together. “It was difficult to bury the ghosts and sweep the film under the carpet, as if nothing had ever goaded us to visit Vidarbha. We owed a lot to the people who had opened their hearts and hearths to two outsiders in their moment of grief. We could not betray their trust. As we previewed and digitised the footage, we re-lived the horror that had unfolded before our eyes in 2006,” write the former journalists in an email interview. “Cotton…” won the Rajat Kamal for the Best Investigative Film at the 59th National Film Awards. But the government-funded Mumbai International Film Festival (MIFF), the couple inform, chose not to show it. They had even organised a special screening for parliamentarians at the Constitution Club, for which they had invited the parliamentary standing committees on agriculture and rural development.